Pokemon Let's Go Venusaur is a Grass and Poison Type pokemon also known as a Seed Pokémon, first discovered in the Kanto region. it's weak against Flying, Fire, Ice, Psychic type moves and has a Max CP of 525, 80 HP, 82 Attack, 100 SP Attack, 83 Defense, 100 SP Defense and 80 Speed. Considering it's stats, the best nature to have is Sassy, this will increase it's Sp. Def and decrease it's Speed stats. What level does Pokemon Let's Go Venusaur Evolve at? The Unevolved Form Bulbasaur Evolves at level 16 into Ivysaur, which then Evolves at level 32 into Venusaur. This pokemon also has a Mega Evolution in the form of Mega Venusaur, which you can use in battle with a Mega Stone. Where to catch and find Pokemon Lets Go Venusaur Locations and their Spawn Rate Chance for that Zone. The best place to find pokemon let's go Venusaur is in the Viridian Forest zone, it will have a Rare Spawn% chance to spawn in the area with a level range of 03-06. This also makes Viridian Forest the best place to Catch Combo Chain hunt Shiny Venusaur or for a Flawless IV Stats. Make sure your relationship with your partner pokemon is good. 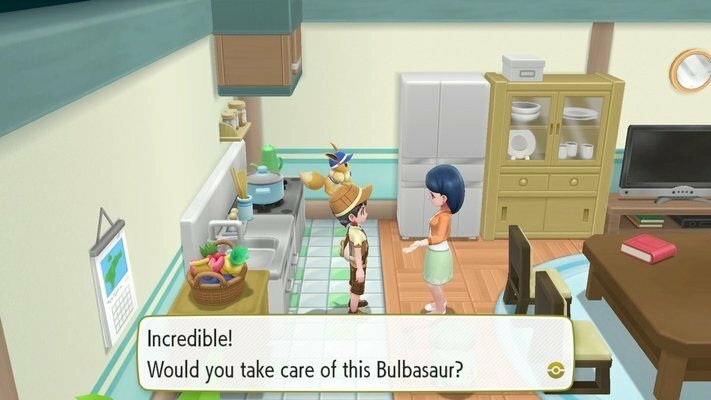 In Cerulean City go in the building to the left of the poke center and talk to the girl to get Bulbasaur Which can evolve into Venusaur. The type of Pokemon Candy you receive from Transferring and Catching Venusaur. We recommend a Sassy Nature for Venusaur, you can visit Madam Celadon to force encounter pokemon of Sassy Nature. Pokemon Let's Go Venusaur Moves You Learn From Leveling Up. 0 Petal Dance Grass Special 120 10 100% Hits every turn for 2-3 turns, then confuses the user. 1 Amnesia Psychic None -- 20 -- Raises the user's Special Defense by two stages. 1 Leech Seed Grass None -- 10 90% Seeds the target, stealing HP from it every turn. 1 Petal Dance Grass Special 120 10 100% Hits every turn for 2-3 turns, then confuses the user. 5 Vine Whip Grass Physical 35 15 100% Inflicts regular damage with no additional effect. 9 Leech Seed Grass None -- 10 90% Seeds the target, stealing HP from it every turn. 14 Sleep Powder Grass None -- 15 75% Puts the target to sleep. 22 Take Down Normal Physical 90 20 85% User receives 1/4 the damage it inflicts in recoil. 31 Razor Leaf Grass Physical 55 25 95% Has an increased chance for a critical hit. 44 Growth Normal None -- 40 -- Raises the user's Attack and Special Attack by one stage. 58 Double-Edge Normal Physical 120 15 100% deals damage, but the user receives 1?3 of the damage it inflicted in recoil. 71 Solar Beam Grass Special 120 10 100% The user of Solar Beam will absorb light on the first turn. On the second turn, Solar Beam deals damage. These are the Technical Machines (TM) Moves that Venusaur can Learn.